The Brechin Participatory Budgeting (PB) process was designed to target the East Brechin area and to involve residents in allocating £20,000 to a variety of local community groups. Key to the process was the involvement of local people in a Steering Group which informed the application criteria, increased community involvement and is currently contributing to the monitoring and evaluation process. Here, PB Scotland goes into detail about the process and some of the learning that came out of it. You can also watch the video below. At the start of the PB process no detailed criteria for funding was identified other than the money must support community health and wellbeing, it was up to community groups to submit applications for the things that they see as important. The PB process, called ‘Your Budget, Your Choice’ targeted 21 streets in the east of the town, it was funded through NHS Tayside - Angus Health and Social Care Partnership with staff support from Angus Council and training support from Scottish Government. To raise interest in the process, and possible participation in the planning, two pre-events meetings were held to give people information about participatory budgeting, from these events five members of the community joined the PB Steering Group. As well as local meetings, leaflets were distributed to every household and posters hung on lampposts around the area to inform people about the process. 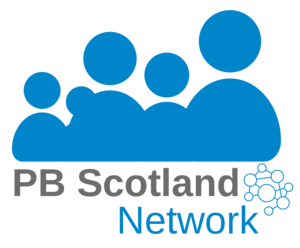 When applications were submitted and applicants were confirmed for the PB process a further leaflet with details of the organisation, what their idea was and the funding amount that they were looking for was posted to every resident in East Brechin. The Steering Group made up of local people was central to the PB process in Brechin. It consisted of local people including the Chair of British Legion, two local representatives (one new to the community and a long-term resident), a local teacher and Brechin’s representative for the Scottish Youth Parliament. The Group was also supported by representatives from Angus Council and NHS Tayside. The Steering Group was established to formulate the criteria for community organisations to apply for the funding. The Group agreed that each organisation must be active within east Brechin and that they could only apply for up to £2,000. The Group then assessed each application to ensure that they met this basic criteria. Importantly, the Steering Group did not judge the applications, instead they had a role to ensure that the application met the basic criteria and if so it went forward to the voting event in November. When all the projects had been identified and had met the basic criteria another leaflet was produced and distributed to each household to let residents know who was applying for funding, what their project idea was and how much they were asking for. The PB voting event took place on 14 November 2015 at Andover Primary School. Those organisations seeking funding were encouraged to set up information stalls so that they could promote their project to voting residents. Each person attending the event received 3 coins at registration for voting, they were only allowed to vote once for each project. When residents had spoken to the stall holders and made up their minds who to vote for the coins were deposited into jars representing each of the projects. The final count revealed that eleven projects would be fully funded and one was not. The PB event attracted 179 residents from 11am to 2pm, people were encouraged to stay for the final count by a raffle with great prizes donated by local businesses. Also adding to the positive atmosphere were the local high school pupils who set up a ‘mocktail’ bar and expertly developed themed alcohol free drinks with local street names. Some of the projects that received most votes and were awarded funding on the day include the initiative to improve disabled access to the much loved Caledonian Railway: The refurbishment and opening of an old night club for use as a community venue: A ten week summer programme developed by the Brechin Community Sports Hub to encourage physical activity, build team work and help reduce crime and anti-social behaviour: Providing fencing, wheelchair friendly paths and a summerhouse for Brechin Community Allotment: Reopening and refurbishing the pool at Inch which is a much missed feature which will increase community participation and social capital and much needed funding for the Judo Club to move to new premises which requires urgent repairs. Commenting on the process Sandra Livingstone (Communities Officer) said; “I think having a local Steering Group was a major strength. As we move forward and the Group stays involved they will become increasingly more comfortable in their role and will need less support.” Sandra added that everyone involved learned a lot in terms of what participatory budgeting is, who can apply and what different roles are involved. Successful grant recipients have been asked to produce a 6 month interim report on how they are using the money and then produce a final evaluation in November 2016. The Steering Group is also following up with these organisations to see how the money is being used, providing support with the evaluation and assessing if they need additional support to manage the grant. For more information on the Brechin PB process view the Facebook page here or search for: Brechin YBYC 20k.